With vegetarian buffets and bungalows lining the cliffs, it's easy to think of Muang Ngoi and its residents as modernized. As you take a dip in the green water of Nam Ou and relax on your tube, you almost forget that you're in the middle of Laos, surrounded by mountains in which minority tribes reside. It's only when you stumble on something so shocking to Western sensibilities that you remember: I'm in a third world country and anything goes. 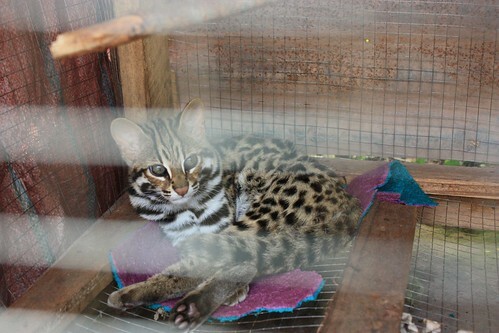 We were jolted out of our traveler illusion by the sighting of a small wild cat held in a cage at one of the guesthouses. Neither tiger nor leopard, the baby looked confused, afraid, and shell-shocked as it stared out at us from behind the metal bars. My first thought was to report the animal to the local animal welfare department, but of course no such organization exists here. Instead, we talked to the owner of the guesthouse, who spoke enough English to tell his side of the story. He first spotted the baby animal while taking tourists on a trek to a Hmong village, hidden in the mountains about 6 hours away by foot. The Hmong are hunters, and no government edict has been able to stop them from going into the jungle and shooting whatever they can find. On this particular trip, they shot the baby's mother and captured the baby, bringing them both back to the village to celebrate. But seeing as the baby wouldn't provide enough meat to make it worth killing, they offered to sell it to anyone interested. The guesthouse owner paid 200,000K (about $25) for the animal and took him home. He feeds it boiled chicken and duck several times a week and over the past two months, he's spent over 2 million KIP on its care. He said he wants to sell it to a "center" in Luang Prabang, though he wasn't clear on what the center would do with it—send it to a zoo, a private collector? We understood one thing: certainly nobody would be releasing this animal back into the wild. We walked away feeling sad and helpless. A few minutes later at the vegetarian buffet, we learned that, just down the one main road, a man supposedly captures monkeys and sells them to China for animal experimentation. Welcome to Laos. Muang Ngoi is a tiny town on the banks of the Nam Ou, which, until a few weeks ago, was only accessible by a one hour boat ride from Nong Khiaw. When we visited in early April, the government had just finished a road and the locals were busy installing 24 hour electricity. Someone joked that round the clock power would mean less babies. And with Muang Ngoi primarily being famous for its seclusion, it will likely also mean less tourists, something the locals, in their pursuit of daily television, don't yet seem to understand. 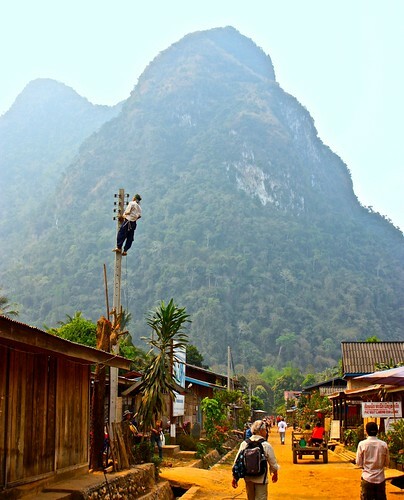 Interested in reading more about backpacking Northern Laos? 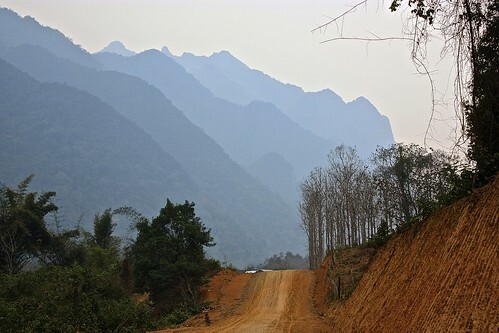 Check out our Northern Laos photo tour and itinerary. What would you have done to help this animal? Let us know in the comments.